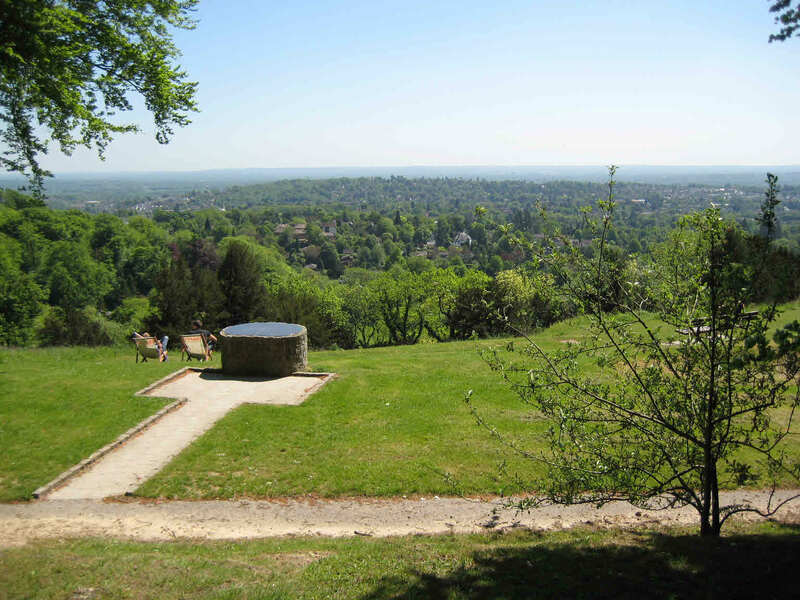 Reigate Hill is on the southern edge of the North Downs and overlooks its namesake town. The viewpoint provides extensive views across Reigate and the flat land of the Weald towards the South Downs. The Wray Lane car park (near junction 8 of the M25) has a café and toilets including a disabled toilet requiring a RADAR key. We picnicked on a seat below the café on a clear, sunny day when planes could be seen landing and departing London Gatwick Airport, 7.5 miles (12 km) away. The North Downs Way, a long distance footpath, heads west from the car park. 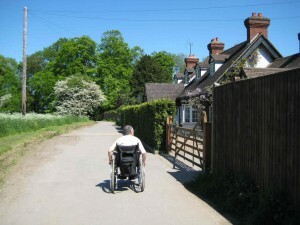 It’s possible (but not easy) to follow this path with a wheelchair towards a viewpoint, about 1500 yards (1.4 km) away. Only attempt this if you’re a fit wheelchair pusher! First, the path crosses the A217 road on a footbridge (with a single step up) before an unmade path takes you uphill: the incline for the first 80 yards (73m) or so is at the limit of what might be achieved by a wheelchair pusher. The incline is then much gentler. You pass cottages and Reigate Fort on a stretch of tarmac road; unfortunately this has several huge speed bumps. The path reverts to an unmade surface to pass two wireless masts before the viewpoint is reached. After taking a well-earned break, retrace your steps to the car park. If you become tired, you can of course turn around at any time. The return journey is all downhill, so much easier! 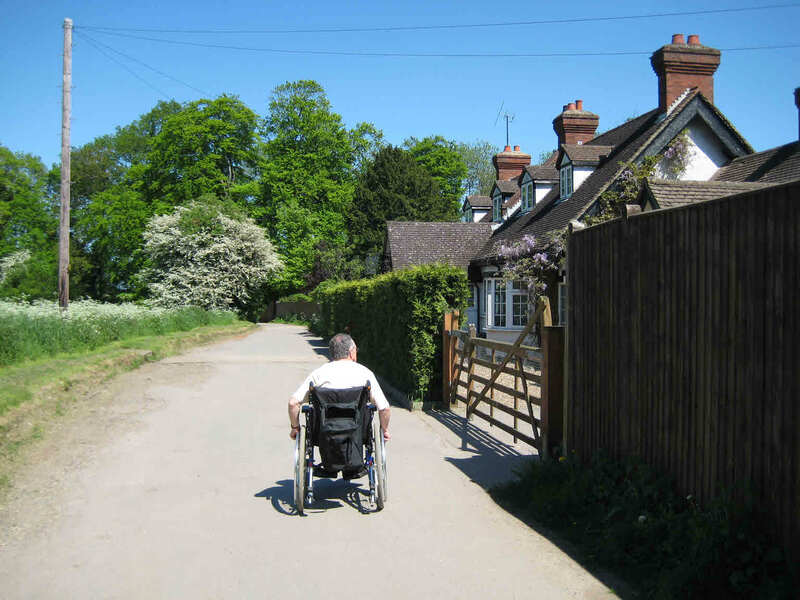 Surrey County Council’s web page HERE shows another path to the viewpoint from a car park in Margery Lane. We haven’t tried this. The car park is fairly small but has a café and toilets (which are located to the right of the café, as you face it). The single disabled toilet requires a RADAR key. The Wray Lane car park is just off junction 8 of the M25. From the roundabout above the junction, head as if for Reigate but keep left and look out for the brown information boards directing you down a lane towards the car park. If travelling north from Reigate town, it’s necessary to go all around the roundabout above the M25 junction. Click HERE to see the location on Streetmap. Satnavs: I’m not aware of a postcode covering this location. Please leave a comment below if you find these pages useful. To report errors or make suggestions please use the contact form by clicking HERE. This entry was posted in Accessible places. Bookmark the permalink.